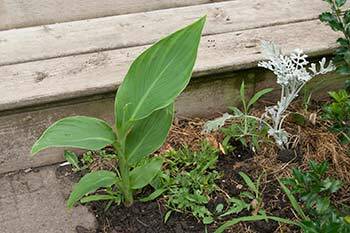 Growing Canna Lilies is simple. Here is how I do it. Not all Canna Lilies produce viable seeds, Hybrids that is mixtures of 2 different varieties, sometimes don't produce seeds or if the seeds are viable usually what grows is not necessarily the same as the parents. 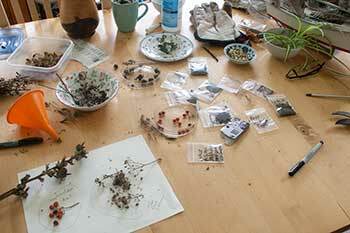 Seeds from hybrid plants revert to the characteristics of one of the parent varieties usually and are not predictable. Often there is a copyright on new varieties. Neither of mine are hybrids or copyrighted. After the plant flowers, the green seedpods are left on the flower spike. Normally I cut them off to allow for more flowering, but if you don't deadhead the plant will produce seeds. The seedpods gradually dry out and turn brown. This is where the seeds are. I have a page talking about hybrids. 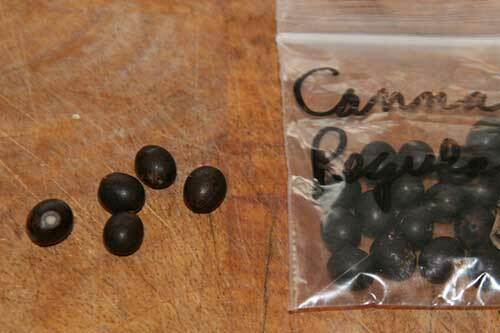 Here are some of the canna lily seeds which are ready to be soaked. If you look at the left hand seed, you can see a spot that has been sanded. This speeds up germination a lot. 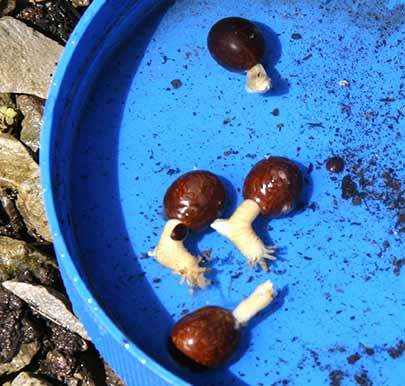 Snipping off a bit of seed or sanding the seed coat is a great help in germination for seeds that have a very hard seed coat which is often quite waxy as well. In this case I could not use my plyers to snip off an end since they are round and very slippery. I just rubbed the seed against a file. Sandpaper works very well too. The seeds should then be soaked overnight. This is not absolutely necessary but it helps hugely. What also helps is a touch of hydrogen peroxide in the water. I used a half teaspoon in 2 cups of water. Plant your seeds in a nice airy soil and don't let it dry out, but don't keep them soggy either. It helps these Canna Lilies to have a little bottom heat while they are germinating, It should be cosy but not hot to the touch. 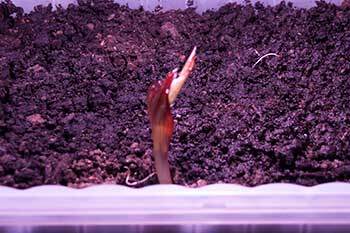 Here is a link to my page on how to germinate seeds. This year's seedlings, I planted both green and bronze came up in less than 10 days. I'm not showing this year's bronze. The soaking, filing and bottom heat really gave them an incentive. This year's seed all came up except 1. I had planted 2 per pot thinking only a few would show. The Bronze coloured plant is from last year, took about a month to come up and only one of the 6 I planted came up. No sanding, no soaking, no heat. My little seedling is doing well. He is growing under the grow light set up I made. 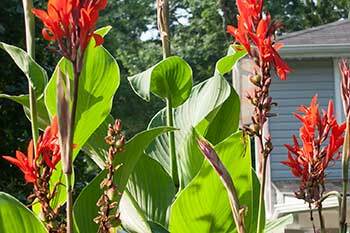 It's not hugely powerful but it was enough for the canna lilies to fill out nicely. I have since then bought a second LED light that is more powerful to start more of my garden seeds. Shortly after this picture was taken it started growing a second shoot. When I planted it out I split the 2 shoots and got 2 plants. Plants started from seed in Winter, will bloom in the same year. If I remember correctly, it takes about 6 months to get a flower. The plant might not reach full size but if you keep the roots over the winter you will get an early crop of lovely flowers in the summer. Once the weather warmed up, I was able to start my tubers and move the little bronze plant out to the pool enclosure. A couple of the tubers already have leaves after 2 weeks. 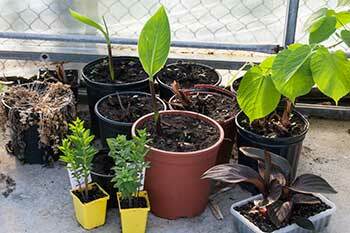 Each year I start a whole lot of Canna lilies from the tubers I have kept, and give the plants to my friends. 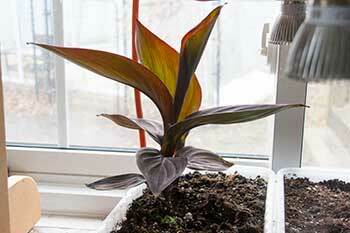 Early summer saw the bronze leaf canna I'd started indoors starting to bloom. It also saw this little canna plant that self seeded. They occasionally seed and I find the odd plant surprising me. I'm watching the plants I've started this year and I'll post more photos as the plants grow up. About 10 days after soaking and planting my canna seeds, I noticed the jar I had used still had a few seeds I had not planted. 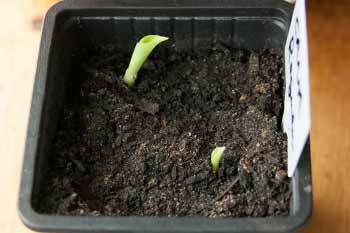 They had germinating and had tiny roots and a leaf spike. I would have expected that staying that long in the water they would have rotted but I had a small amount of peroxide in the water and this might have helped. I planted them and we'll see if they do any better than the more conventionally planted seed do. My page on what makes seeds start better talks about using peroxide. 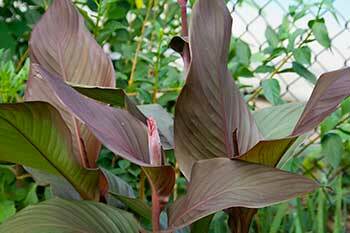 Photos of different cultivars of Canna. Outsidepride Salmon Canna Seeds - 10 seeds, Amazon's Choice Product.